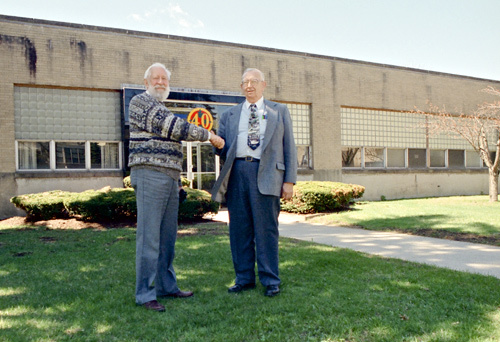 Walter Siegmund and Brian O'Brien, Jr. in front of the American Optical Company Research Building where the Todd-AO process was developed. In 1997 Willem Bouwmeester and I went to the United States for a Historical Wide Screen Gathering in Connecticut. I met Brian O'Brien, Jr. for the first time, when he picked us up at the airport in Hartford. A tall man with a healthy sense of humor, Brian O'Brien, Jr. was employed at American Optical Company during the development of the Todd-AO process 1952 - 1957. He was generally in charge of planning and development of motion picture production equipment. I had contacted Brian some years before our first meeting and we corresponded back and forth about Todd-AO, a subject we both felt very passionate about. During the visit we were introduced to Walter Siegmund and John Davis who also worked on the Todd-AO process. Brian and Walt were our friendly hosts for 3-4 days, and with them we visited American Optical in Southbridge, Massachusetts. It was very moving for all, as this was their first visit in more than 30 years. When visiting Brian's house, he showed me a set of 6 ring-binders with a complete set of all things Todd-AO. Every single piece of Todd-AO equipment manufactured by American Optical company for the process between 1953-56. Brian had this catalog made when the entire range of equipment was ready for production of the first movie "Oklahoma!" in 1954. As he explained, it was a document to explain the equipment made for the Todd-AO Corporation. 5 volumes of American Optical company's catalog of all things Todd-AO. Every single piece of Todd-AO equipment manufactured for the motion picture process between 1953-56. A few years later Walter Siegmund kindly sent me his set of ring binders as well as a few other rare pieces of Todd-AO equipment - including a 64 degree lens and a Bug Eye viewfinder. Unfortunately Walt's set was short of Volume #1. Brian later corrected that, by having his Vol #1 re-photographed on 35mm film for me. In his files Brian also found three envelopes of black and white stills of the Distortion Correction Mark III Printer when it was installed in Fort Lee, New Jersey. Brian kindly had 35mm negatives made of 50+ stills of the unique and long-gone printer too. I have always wanted to add this Todd-AO catalog of equipment to the web site, but time and resource restrictions have prevented me from doing so. Until now. My only regret is that both Brian and Walt have passed away. I really wanted to do this much earlier, however, that has not been possible. Each volume of the catalog ring binders had descriptions of the equipment. Where missing, Brian O'Brien, Jr. have produced additional captions and explanations for the remaining stills, including the printer. All his captions have been reproduced here from the original sources by Anders M. Olsson, Sweden and Brian Guckian, Ireland. Hello Thomas, What a great section on your site!!! This is a great record of the depth of the undertaking of the Todd-AO process. GREAT JOB!!!!!! 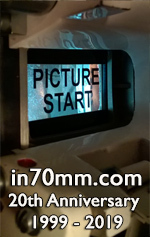 65mm Todd-AO frame from 1953 with distortion correction with zero droop. The view of American Optical Company across the lake in Southbridge, Massachusetts, USA. The American Optical Research building is seen to the left of the big building. All images are clickable to be able to enjoy a large version of the equipment. Front entrance to American Optical Research Center building in Southbridge, Massachusetts, USA. View of American Optical's machine shop, probably in Southbridge, Massachusetts, USA.